My research program focuses on insect ecology and management with an emphasis on the study of insect pathogens and invasive species. 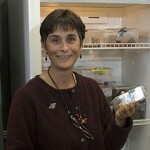 I primarily focus on fungal insect pathogens, and my program spans from more basic aspects of pathogen dynamics, epizootiology, and factors affecting disease susceptibility and defense against disease, to evaluating microbial insecticides and developing strategies for their use in integrated pest management programs. My current research focuses on the ecology and management of the invasive European red (fire) ant, Myrmica rubra, and the lily leaf beetle, Lilioceris nigripes. Arevalo, H.A., J. Collins, E. Groden, F. Drummond, and K. Simon. 2009. Marking blueberry maggot flies (Diptera: Tephritidae) using fluorescent diet for recapture studies. Florida Entomologist 92 (2): 379-381. Booth, S.R., F.A. Drummond, and E. Groden. 2008. Small Fruits. Pp. 597-616. In: Field Manual of Techniques in Invertebrate Pathology, 2nd ed. (L.A. Lacey and H.K. Kaya, eds). Kluwer Academic Publishers, Boston, U.S. (2nd edition of chapter). Garnas, J., F.A. Drummond, and E. Groden. 2007. Intercolony aggression withn and among local populations of the invasive ant, Myrmica rubra (Hymenoptera: Formicidae), in coastal Maine. Environmental Entomology 36:105-113. Klinger, E., E. Groden, and F.A. Drummond. 2006. Beauveria bassiana horizontal infection between cadavers and adults of the Colorado potato beetle, Leptinotarsa decemlineata (Say). Environmental Entomology 35(4): 992-1000. Groden, E., F.A. Drummond, J. Garnas, and Andre Franceour. 2005. Distribution of an Invasive ant, Myrmica rubra (Hymenoptera: Formicidae), in Maine. Journal of Economic Entomology 98(6): 1774-1784. Alyokhin, A., G. Porter, E. Groden, and F. Drummond. 2005. Colorado potato beetle response to soil amendments: A case in support of the mineral balance hypothesis? Agriculture, Ecosystems and Environment 109: 234-244.